On Tuesday, September 18th, 2018, McDonald’s workers in 10 cities across the U.S. walked off the job to demand stronger workplace protections against sexual harassment. The strike, organized by #MeToo McDonald’s, is the first multistate walkout protesting sexual harassment. While many believe workers’ right have a long way to go, the above suggest that workers’ demands are gaining traction. The Hunter College NYC Food Policy Center has created a timeline highlighting key junctures of the food workers’ rights movement in NYC in recent years. The Fight for $15 Begins: In New York City, the Fight for $15 movement launches its first strike, when hundreds of fast food workers leave their posts and take to the streets to demand a living wage, better working conditions, and the right to form a union without punishment by their employers. The First Promise: Mayor de Blasio announces he will advocate for a change in New York State law that would allow the city to set its own minimum wage, aiming for $15 by 2019. Mayor Signs Executive Order to Increase Living Wage: Mayor de Blasio expands the Living Wage Law, hoping to match the living wage with the minimum wage so that all hourly workers would be earning at least $15 per hour by 2019. The Living Wage Law, first enacted in 2012, required employers receiving at least $1 million of financial assistance from the City or a city development entity to pay no less than the living wage – an informal benchmark, different from the minimum wage, approximating the amount an individual must earn to cover the basic costs of living (food, rent, etc) in a particular locale – to their employees at that site. De Blasio’s expansion broadened the scope and applicability of the law to include workers at retail and fast food establishments that receive financial assistance from the City. As of September 30, 2014, the living wage for NYC workers who do not receive benefits, such as health insurance, is now $13.13 per hour, up from $11.90. The living wage for those who do receive benefits is now $11.50 an hour, up from $10.30. The order affects approximately 4,000 fast food and retail workers who had been earning close to the state’s hourly minimum wage of $8. The Fast Food Wage Board is Created: Governor Andrew Cuomo, who had raised the state minimum wage from $7.25 to $8.75 in 2013, instructs Acting State Labor Commissioner Mario J. Musolino to create a Fast Food Wage Board research and make recommendations on increasing the minimum wage for fast food workers. Fast Food Wage Board Approves a Phased-in Minimum Wage of $15: The Fast Food Wage Board’s recommendation for a phased-in minimum wage of $15 for fast food employees is approved by Acting State Commissioner Musolino. $15 Minimum Wage is Approved for NY State and NYC: The New York State Wage Board approves a $15 minimum wage for New York State and NYC. The Board’s approval ensures that all fast food employers, regardless of whether their establishments receive financial assistance from the City, must pay their workers $15 an hour by the end of 2018. 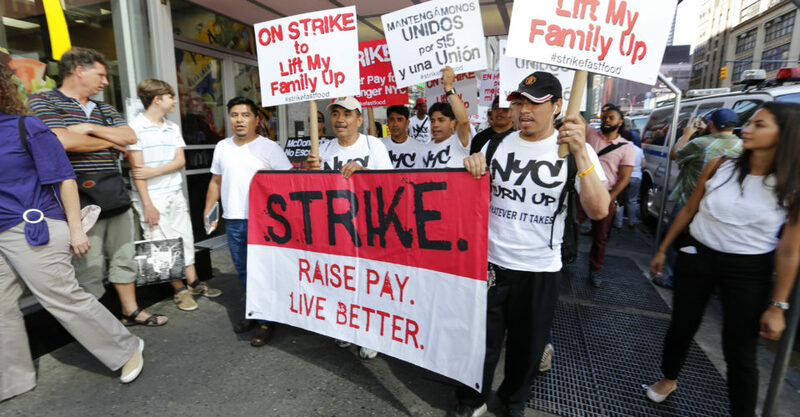 Minimum Wage Phasing Beings: The first jump in minimum wages for all fast food workers in NYC was to $10.50 per hour. At the time, New York State’s minimum wage stood at $8.75. -Requiring fast food employers to provide at least 2 weeks’ advance notice of work schedules to employees and provide a schedule change premium when hours are changed after the required notification deadline. -Prohibiting fast food employers from assigning “clopening” shifts to employees without providing them additional compensation. -Give their workers the option to make voluntary contributions to not-for-profit, nonunion organizations of their choice – in other words, organizations that could advocate for them – through automatic payroll deductions. As a result of this provision, more than 1,200 fast food employees consented to donate a portion of their monthly paychecks to Fast Food Justice, an advocacy group for fast food workers. -Provide additional work to existing employees before hiring new employees. Fair Workweek Legislation Passes: Legislation is now in effect that gives fast food and retail workers the right to predictable schedules and paychecks. 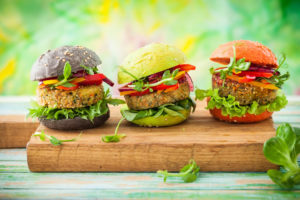 Fast Food Chains Drop “No-Poaching” Policies: Seven fast food chains drop “no-poaching” policies that bar employees from moving to other franchises within the same chain. Fast food workers will see their hourly pay increase to $15 by the end of this year, but we’re nowhere near the end of the tunnel. Even though a $15 hourly rate is a (big) step in the right direction, many believe that it is still too little to live comfortably in the city. And since fast food work is typically seen as a temporary or supplemental gig, fast food employees have never successfully unionized. That said, however, nonprofit organizations, such as Fast Food Justice and Restaurant Opportunities United (ROC), have sought to fill the gap in representation. While the groups do not negotiate contracts and working conditions as unions do, they have nonetheless acted as leaders by staging protests and advocating for fair wage laws. There are, of course, arguments against raising the minimum wage. A higher wage could translate to higher menu prices for consumers as well as cuts in their hours and layoffs for workers. In extreme cases, business owners who find their payroll costs surpassing their profits shut down entirely. Some evidence, however, says otherwise. In 1992, when Minnesota restaurant workers were paid the full minimum wage after the state began phasing out the tip credit nearly a decade earlier in 1984, data shows that annual revenues increased (to be fair, growth was steeper from 1982 to 1987, when the tip credit was still in force. But there was no restaurant apocalypse as some suspected there would be.) Since 1990, employment in the Minnesotan restaurant sector has nearly doubled. A study by UC Berkeley found that Seattle’s wage hike also improved pay for restaurant workers without causing disemployment. And another study done by Cornell University found that small hikes in the tipped minimum wage don’t lead to fewer jobs. The Fight for $15 is about more than a bigger paycheck. It’s about raising the standards of fast food labor practices overall. The #MeToo McDonald’s strikes are a necessary extension of that fight. Read more about NYC’s wage increases here and share your thoughts with us on FaceBook, Instagram and Twitter.